Here is an awesome piece of art inked on the delicate body of this female. 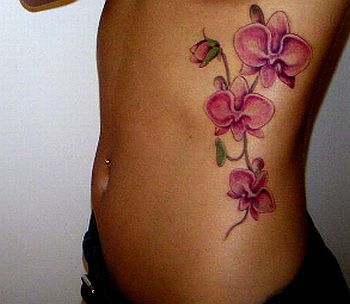 The flowers are fine and look amazing on the skin with its colors. Belly tattoos: Cute or funny? Silicone implant: Not just a female affair! Tattoo, What do they say? Wittily cute – Skull guns tat too! Culinary art – Passion for cooking ! Inspirational tattoo – Live in the present! Fear provoking demon head and skulls tattoo! Cute little Hello Kitty Skuterrfly tattoo! Cross tattoo for lovers-God be with you! Butterfly tattoo on happy feet!